Enjoy this unique swimming adventure with the Pacific Bottlenose dolphins. As you travel down to Cabo San Lucas, Mexico, you can pet, hug, kiss, play and interact with these unique and majestic marine mammals. This is not a tour you want to miss out on! We recommend you remove all jewelry, including wedding rings, ear rings, and piercings, before coming to the dolphin center. Although we provide an area to secure your personal belongings, it is easy to drop, lose or misplace jewelry, so we recommend you to leave your jewelry and small items secured in your accommodation’s safe or front desk safe. For your personal safety and the well being of your unborn child we do not allow pregnant women to participate in our dolphin and sea lion programs. Min. Age: 4 years old. EACH Child 4-9 years old: Must be accompanied by a paying adult (16 or older). 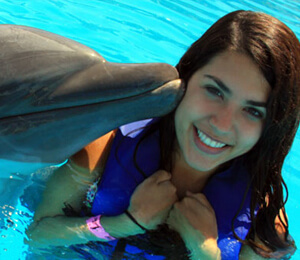 I have been to the Bahamas many times, but Cabo Dolphin Swim and Ride Experience is one of my favorite trips! It includes everything that everyone should do here. As a Bahamas veteran, I can say only the best about this experience!